Here to help beginner and intermediate birders, Twigle automatically identifies birds from their photos and birdsongs. Simply select a photo or record a singing bird and Twigle will identify it. Twigle uses image recognition to help you identify 540 species of birds from North America, 350 species from Southern Africa and 310 species from the UK & Ireland with an accuracy of 60%. 90% of the time the correct species will be in the top 5. As a complete field guide to birds, Twigle includes a powerful search tool, HD pictures, detailed bird descriptions and birdsongs, all meant to help you better know your birds. Twigle is the first app in the world to have both image recognition for bird photos and audio recognition technology for bird songs. Download Twigle’s offline database containing information on bird behavior, habitat, diet, breeding and text description. Once downloaded, there’s no need to connect to the Internet to access the database – it’s all on your phone, ready for birding even where there’s no Internet connection. 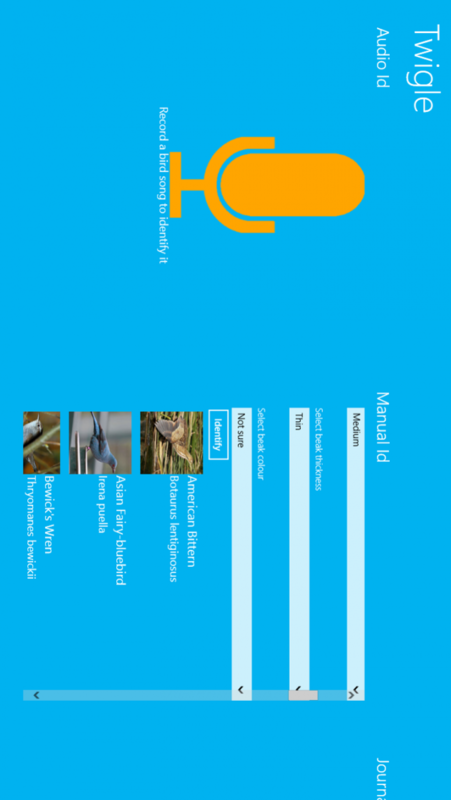 This bird identification app also gives you access to multiple images and composites for each bird, hear multiple bird songs and calls, and see highly detailed bird descriptions including habitat and distribution, feeding, breeding, and of course, their calls and songs. Download Twigle and enjoy birdwatching in a whole new way! 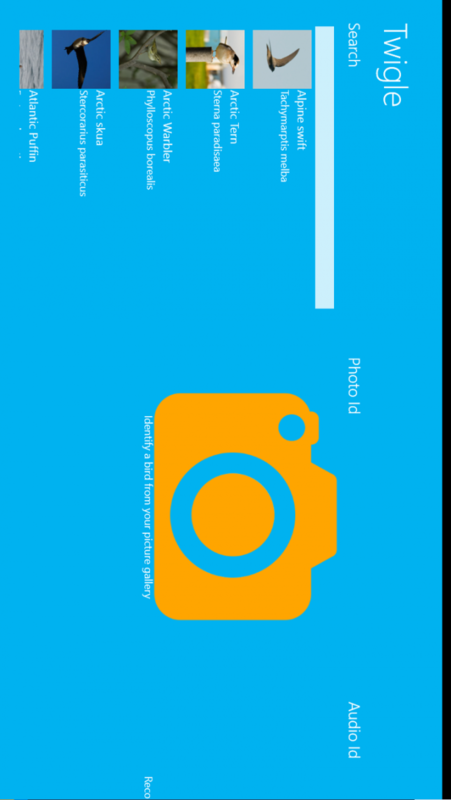 • Twigle's image recognition works with clear images, for example taken using DSLR cameras with the appropriate lenses. 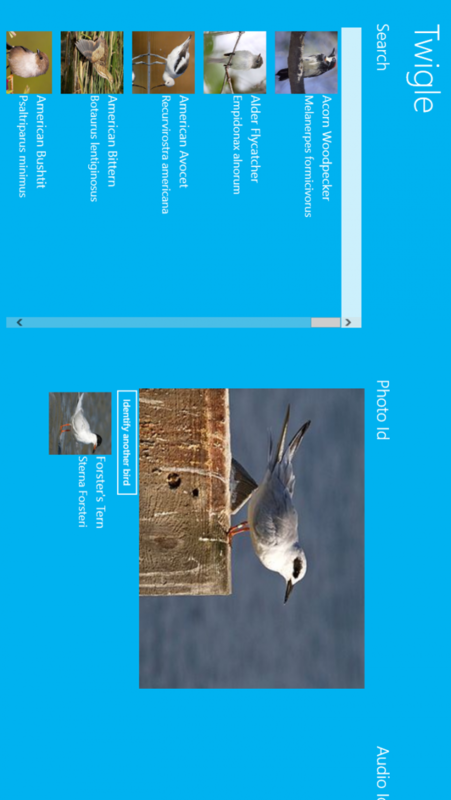 You can then transfer the photos to your device to identify the birds. Photos of birds taken with the phone's camera are generally not crisp and clear and thus are not the use case of this app (which is why there is no feature to take a photo using the app). We are working to improve this in later versions. • A purchase of Twigle comes with a Starter Credits Bundle with 150 credits, that allow you to perform bird image recognition on 150 photos. When these are finished you can make an in-app purchase of Premium Credit Bundles to photo id more birds. • Starter credits have a quota of 5 bird photo identifications per day. 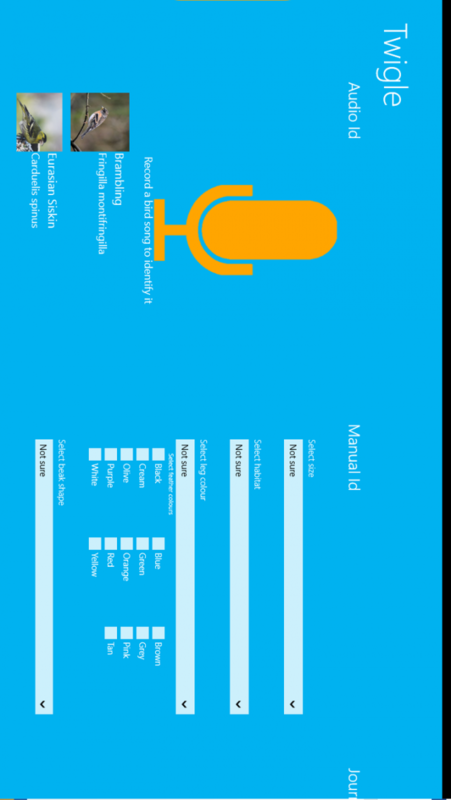 • Twigle's audio recognition is not yet available when you download the database for Southern Africa. • Currently Twigle performs audio recognition of birds only for the most common garden birds (50 for North America & 40 for Britain & Ireland). You can view the list on the Audio Search List page within the app. Twigle's audio recognition puts, for 70% of the time, the correct bird is in the top 10. Twigle's database downloads are quite large (several hundreds of MBs) and so it is recommended that you download over WiFi to avoid huge cellular data charges.